Cheese is a great appetizer (and in my opinion, it's great as a snack, main meal, and even dessert!). For our guests to whet their appetite before dinner, I made the following dish. It's a spin on the classic Caprese salad which is simply mozzarella cheese, tomatoes, fresh basil leaves and a balsamic vinaigrette. 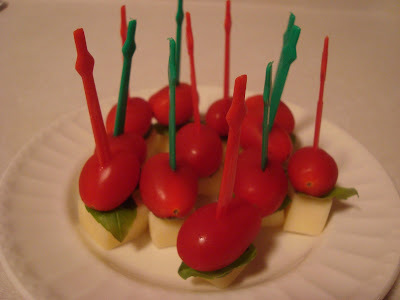 Rather than serving this as a traditional salad, I adapted it as an appetizer on a stick. Now who doesn't like eating foods on a stick?! With a cocktail pick, place a grape tomato, fresh basil leaf and a cube of mozzarella. Repeat until all ingredients/pick are used. Place on a serving plate with the balsamic vinaigrette in a small dipping bowl on the side.